Patriots improve to 2-0 with 25-14, 25-11, 25-18 win. Wootton's home opener against a tall, athletic Damascus team was a solid showing with every Patriot contributing. Once again, in game 1, Aaron Yee and Tony Malinauskas led the Wootton attack, Michael Ip and Chris Wong played strong defense, and Eray Wang and Kevin Liang contributed solid utility play. Nicolas Texier and, in his first start, Eric Zhang, were forces at the net in the middle. Freshman Justin Fowler directed the Wootton offense in games 2 and 3, with strong performances by Clayton Zhang, Jeffrey Qiu, Mark Yang, Elliott Liu, and Xinyuan Wang. A highlight of the match was senior Zo "serve me at your own risk" Asmail's debut in the back row. Holding off a Damascus rally in game three, Zo rallied the team (punctuated by multiple ovations from the bench), with several clutch "fist bumps" and a final zinger to Eric "I will accept your zing" Zhang for the final kill. The Patriots will head into Spring Break with a 2-0 record and will face a stearn test upon their return when they travel to Rockville to face a well-coached Rams team on Wednesday, April 7. It's tough to lose the close ones. Losing the close ones leaves little reward for competing head-to-head with an opponent in every way but the final slightest of a margin of victory. Wootton has been there, including 2009's semifinal playoff loss against eventual county champion Richard Montgomery Rockets. For the past several years, Wootton and RM have gone head-to-head each time with the outcome of each game and match being decided by the slightest of margins. There have been close ones in this cross-town rivalry. Tuesday's match at Richard Montgomery was expected to be no less than a highly competitive contest. This time, as a season opener, both teams could take measure against each other on how preseason training has progressed, and determine what improvements need to be made. Richard Montgomery's roster includes two veteran players from Maryland Volleyball Program's nationally-ranked elite team, and a core group of skilled players (including a kid with the same last name as Wootton's coach...yes, a father-son rivalry) that are well-coached. The Patriots had their hands full. 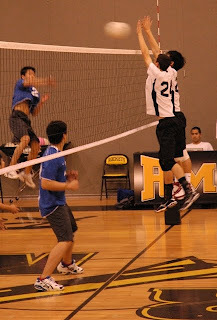 Aaron Yee and Tony Malinauskas led the Wootton side of the net. Strong all-around games by Kevin Liang and Eray Wang steadied the rotation that saw veterans mixing it up with newcomers. 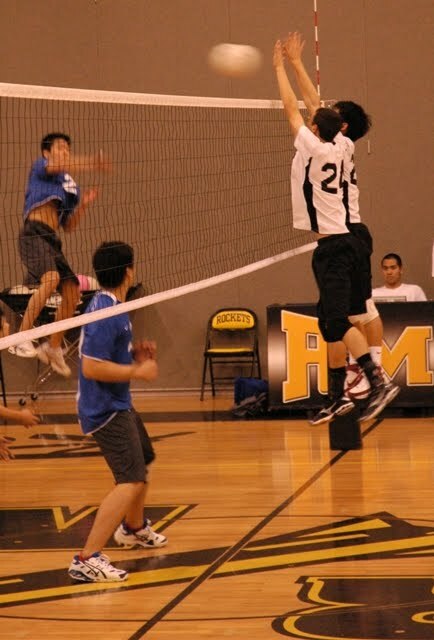 Veteran Clayton Zhang and newcomer Nic Texier had good games blocking middle, Sophomores Chris Wong and Michael Ip gained valuable playing experience in the back row. Freshman Justin Fowler and Jeffery Qiu were solid coming off the bench. Yes, Wootton has lost it's share of close ones. This time, it was good to squeak out a road win against an RM team that is favored to win the county championship (see Gazette season preview >> ). Expect RM to get stronger and stronger as the season progresses....the hallmark of a veteran and well-coached team.